At Loughborough Studios we welcome everyone from the age of 6 yrs and upwards who are looking for professional vocal tuition, from the absolute beginner, to those who wish to improve their current skills or learn new techniques. Lessons can include learning to read music notation and exploring new techniques as well as singing in a range of musical styles. 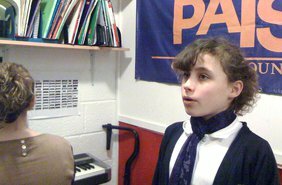 Our students are welcome to learn to sing just for fun or to follow a recognised syllabus in preparation for graded examinations.